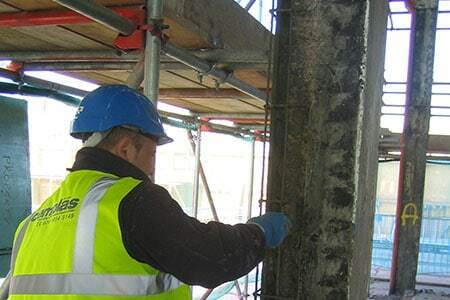 Cemplas concrete repairs extend the life of buildings and car parks. Surveyors identify the cause of decay with hammer testing, visual survey, carbonation test, and chloride test and cover meter test (this records the depth of steel reinforcement below concrete and provides a “low cover” warning). Typical concrete problems are caused by low cover to the reinforcement, carbonation of the concrete and/or high chloride levels. Surveyors identify the cause of decay with hammer testing, visual survey, carbonation test, and chloride test and cover meter test (this records the depth of steel reinforcement below concrete and provides a “low cover” warning). Typical concrete problems are caused by low cover to the reinforcement, carbonation of the concrete and/or high chloride levels. 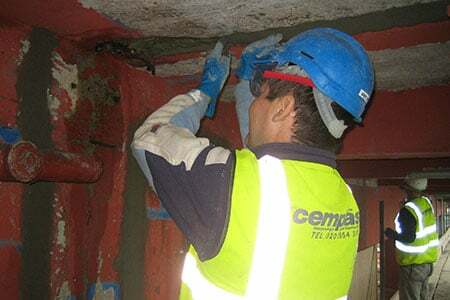 Cemplas solutions include the reinstatement of defective concrete and the application protective Anti-Carbonation coatings which slow’s the loss of alkalinity to the concrete. Some coatings can regenerate the concrete and stop decay. Knowledge is important to concrete repairs and Cemplas can make recommendations that reduce costs. An accurate survey will establish the true cost of repairs at the outset thus avoiding the possibility of cost implications during the contract period. Cemplas also provides remedial treatment for new buildings. These relate to problems usually caused by a building mistake during construction. Concrete Repair is not a standard process as the quantity of work required and the nature of that work may vary greatly.